Discover how to prosper in an ever-changing world with The Strangest Secret for Succeeding in the World Today. One morning more than 40 years ago, an amazing message was played for a group of salespeople at Earl Nightingale’s insurance agency. They were utterly electrified by what they heard. Word of the message spread like wildfire, and everyone who heard it was positively ignited into action. Thousands of requests for a copy of the recording came pouring in. This was the beginning of The Strangest Secret. Within no time, more than 200,000 people had called, written, or just walked right into Earl’s office to request a copy. As years went by, that number soared above 1,000,000. Today, The Strangest Secret remains one of the most powerful and influential messages ever recorded, and continues to transform the lives of everyone who hears and heeds it. Harness the power of The Strangest Secret! 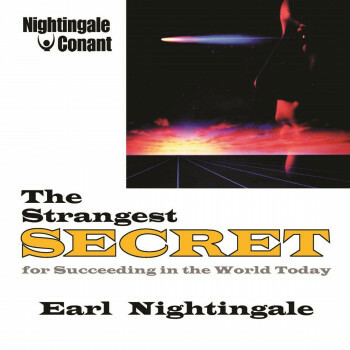 In The Strangest Secret for Succeeding in the World Today, Earl Nightingale expands the themes of that remarkable original message into a comprehensive program that explores the critical question, What does it take to prosper in an ever-changing world? — and answers it with success building discoveries that have stood the test of time. Through Earl's collected wisdom, you'll learn about two categories of successful people and how to determine the category in which you belong. Click here to view The Strangest Secret Movie!